In 2015 we once again followed the lead of previous years during the offseason, continuing Girls Gen, the Robotics camp and volunteering at other events. 2015 was also the first time in 4 years that we didn’t make some sort of Bear pun in the robot name. This year was also the first year in which we powder coated our robot. The catalyst for doing this was our vice president, Brett, who did a lot of the work in finding a sponsor, and learned how to powder coat himself. Because of these efforts, Maverick became the first robot of ours to be better looking than Bearmageddon (in my opinion, anyway). 2015 was another one of those games that just made you wonder how on earth they came up with it. Recycle Rush was played on the usual field, except it was split entirely in half by a step in the middle of the field. Entirely in half. The only interaction between the opposing alliances was in going for the game pieces on that step, or in doing the co-opertition for this game. And the game pieces were grey totes (those things with the interlocking lids that you can store stuff in), recycling containers (RC’s), and pool noodles. The totes could be stacked up to 6 high on a scoring platform, and then be capped off with a recycling container for a multiplier based on height. One noodle per RC could be “recycled” into the RC for more points, while the rest could be thrown by the human player for points if they were on the opposing alliance’s side. Each side started with 3 RC’s, while there were 4 on the step that could be contested by either side. Totes could be found in the landfill (an area next to the step on both sides), on the step and behind the alliance walls. There were also 3 yellow totes known as co-opertition totes that could be stacked in autonomous for 20 points, and also stacked 4 high on the step for a 40 point bonus- this would require the opposing alliance to score at least one tote as well. This game was also not evaluated based off of win/loss, but off of average score. This was true even in Eliminations, which were now called Playoffs: only the Finals match was played with wins and losses. Our team came out of Kickoff mildly disappointed at the lack of defense, especially our driver, who loved smashing into stuff in the previous year. We quickly realized that the RC’s on the step would be a chokehold strategy during autonomous at District Championships and World levels, but elected to ignore them for the time being, wanting to have weight for other things, while also figuring that many other teams would realize the same thing, making their own to increase their chances of getting picked. We decided on picking up the totes in their long orientation from the Human player, using a mechanism that picked up from just one side to do so. Realizing that this caused the totes to fall off if we tried to pick up more than 2 at once, the team also had to put on a pneumatic “foot” that pushed out the totes, allowing us to keep them level relative to the ground. The claw we made could also pick up RC’s by hooking underneath the lid. We also decided to make Maverick our first non-tank drive robot, instead making an H-drive. This is very similar to our drive of previous years, except it allows us to strafe sideways using two sideways facing omnidirectional wheels. Our forwards facing wheels were also Omni. This drive allowed us to drive over the scoring platforms (which were slightly raised) without fear of tipping or getting stuck, but let us strafe for greater precision in placing stacks, or in collecting totes. Our first event was once again Auburn Mountainview, in the first week. We went in expecting to do okay- our robot still had some bugs, but we were pretty sure we had worked them out. Then in our first match, our alliance scored 0 points. We learned in that match a couple of things. First of all, we could not collect from the human player, but our collector was fantastic for the landfill. Second of all, we still could not lift more than 3 totes without them falling off. Thirdly, we were pretty much useless with RC’s: our claw barely held them, and we couldn’t cap a stack taller than 3 totes high. Our claw was also a bit unstable with the totes, and our driver was still learning how to drive precisely and calmly in order to avoid dropping the stacks. Our team continued to learn how to play this game, ending qualifications ranked 10th. Picked by the 6th alliance captain 2907, we picked 3221 as our 3rd robot for playoff competition. After barely qualifying to move on to Semi-finals, our team figured out how to work together, and 3221 had a few great games, allowing us to qualify for the Finals round. In the finals, we were crushed by the first ranked alliance of 1983 and 1318. Between Auburn Mountainview and Mount Vernon (our week 3 competition), our team made two major changes. The first was to add an actuated RC claw to the top of our robot, so that we could stack without it falling off. Our second was to change the foot on the claw to let us stack more than 3 totes at a time. This allowed our robot to perform better, but we still ended Qualification rounds ranked 13th. Picked again by 2907, this time as the 4th ranked alliance, we picked 4060 as our third robot. Unfortunately there were too many other good robots, and we only made it to Semi-finals. Realizing that not many other robots were making good grabbers for the step RCs, our team decided to add one of our own before the District Championships, taking weight out by adjusting our collector. We also changed our RC holder to allow us to make stacks 6 totes high. At District Championships, our robot performed well, ending qualifications ranked 17th. However, despite our great performance and fast grabber during autonomous, our robot was not picked for playoff competition. Despite that, the team still qualified because of the district point system (which was in this year based on a complicated algorithm that gave district points based on average score). Our advisor and lead mentor, Darren Collins, also won the Woodie Flowers Finalist Award, which is an award for the mentor who has had the greatest impact compared to every other mentor in the district. Our team was overjoyed that we had qualified for World Championships. Deciding that there was nothing more we could do to improve our robot within the week or so we had to work, we instead gave our drivers and programmers as much time as possible to improve our robot in the non-visible aspects. World Championships was, as usual, an overwhelming experience, a chance to see amazing robots at the upper end of their game. Teams like 148, 254, 2826, 4613 and 1678 stretched the limits of engineering, utilizing well the lack of size limits and creating fantastic and unique autonomous modes. We were also able to meet teams from a huge amount of countries, including Australia, Brazil, and even China. Our robot performed as well as it had before, which was slightly above average compared to all of the great robots in our division. Due largely to a rough match schedule, our robot ended up ranked 53 of 76 robots on our field. Expecting to be overlooked, we were overjoyed when we were picked as the 3rd robot by the 3rd ranked alliance of 3663 (CPR- a team that can make good alliances from any ranking) and 1574 (an Israeli team), picking as our 4th robot 5586. During an extremely close playoff round, our alliance was able to qualify for finals because of our ability to grab RCs faster than most teams, and being more consistent than the other alliances. However, the winning alliance of 1114, 148, 1923 and 900 simply proved too fast during autonomous, depriving our alliance of the RCs we needed to win. Making it to the Finals on our field is the best our alliance has done yet, making 2015 one of our most successful years ever. 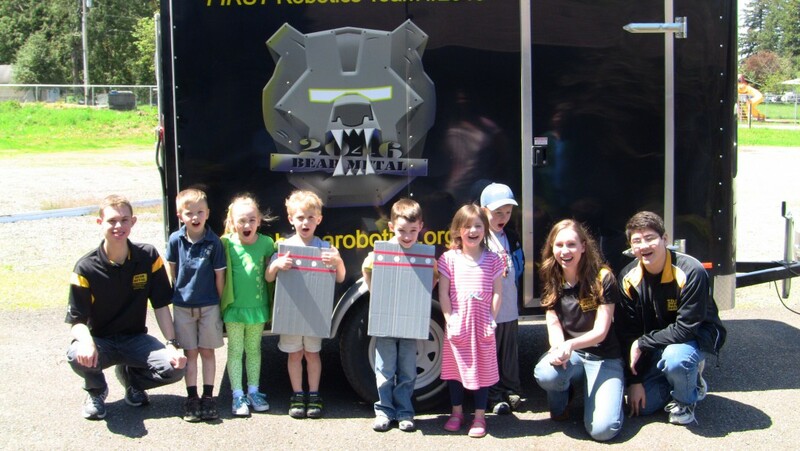 The offseason prior to the 2014 year was used by our team to continue the efforts of previous years, also adding a Robotics camp. This included a good deal of volunteering at local FTC and FLL events, as well as Girls generation. 2014 was the first year in which the Pacific Northwest (PNW) District existed. This changed the way in which we qualified for World Championships. In the District model, every team competes at two small events of about 30 robots (and sometimes as a surrogate in a third), usually in high school gyms. 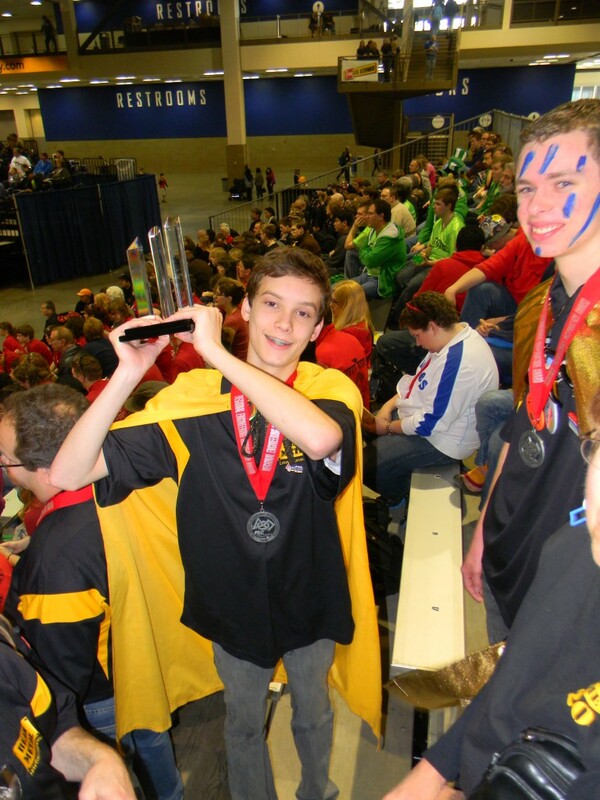 Teams are awarded district points for winning matches, being picked for elimination matches, making it to semifinals and finals, and winning events. At the end of 6 weeks, the top 64 teams by district points qualify for the district championships, as well as any team that won a District Chairman’s award that was not in the top 64. At District Championships (DCMP), every point value is tripled (i.e. an award that was worth 5 points is worth 15 at DCMP), and the top 26 teams by district points move on to World Championships, including the winning alliance of the event, 3 Chairman’s winners, one Engineering Inspiration winner and a Rookie All-Star. 2014 was the year of Aerial Assist. This game was played on a field that was completely open except for a truss in the middle of the field that was around 5 feet tall. The field was separated into 3 zones, marked off with tape. If the ball was possessed in all 3 of these zones by all 3 alliance members, a huge bonus was given to the score (with a smaller bonus for two robot possessions). All of these points were dependent on scoring the ball in either a high goal across the alliance wall, or in small square goals on the ground in the corners, worth less points. There were extra points given to shooting the ball over the truss and catching the ball after it goes over (once per entered ball). The team could only have one game piece, a big inflated ball (2 feet in diameter), on the field at a time, except for in autonomous, when there could be up to 3 balls. Because of the essentially unrestricted defense, the penalties had huge point values. During our strategy session after kickoff, the team decided that there were 3 main goals in this game: have a really good drivetrain, collect the ball effectively, and shoot the ball. Because of the simplicity in design, the team realized that we actually could do everything relatively easily this year. We did, however, choose to prioritize getting the robot done as quickly as possible to maximize driver training time. The team decided to make the robot as short and lightweight as possible, using a tension-based catapult by pulling back on springs. After many prototypes, our collector was made with an angle in it in order to maximize the area in which we could collect a ball. Part of the reason our team wanted so much practice time was because we had signed up for an event in the first week of competition. The practice time we had paid off at the Auburn Mountainview district event. While many other teams were working out major kinks in their robot performance and strategy, our only major issue was the ball not settling properly in our catapult, an issue we solved by scoring in the low goal. We also became a thing of terror on defense thanks to our extremely fast drivetrain (capable of speeds of 17 feet/second), and our love of ramming into robots that couldn’t hold balls stably. Our robot at this event and throughout the year was easily identified as the one that was zooming across the field at very high speeds. Due to a slightly tough match schedule, we ended qualification rounds in 7th place, but were picked by the second place team, 2907, with 3237 as our third pick. We soundly beat our valiant opponents in the quarterfinals and semifinals, but faced quite a challenge in the finals match. The first ranked opposing alliance of 2557, 3393 and 4772 were strong, beating us in the first match. To add to our problems, 2907 was having some issues with their catapult and collector. Even after using our 5 minute timeout, the problems were not entirely fixed. Then, to our surprise, an announcement came out that the first ranked alliance had used their timeout. We were amazed; they had appeared to be performing without any glitches. That was when we realized that they didn’t need the timeout: they used their own timeout to let us finish fixing our alliance’s issues. We went on to beat them in the next two very close games. Our team is forever indebted to 2557 and 3393 for their amazing show of gracious professionalism, willing to lose if it meant they lost fairly. To add to our euphoria, the team also won the District Chairmans award at this event. Between our first event and our week 3 Mount Vernon event, the team decided to change our catapult to improve our accuracy. By making its point of rotation higher, we were able to shoot with a flatter angle, making it easier to get the ball through the goal. The new catapult also made our robot look scarier when looked at from the front. At Mount Vernon, we once again performed well, being juggernaut both offensively and in defense. Ending Qualifications in 5th place, we were chosen by the first ranked rookie team, 4918, picking 2980 as our third robot. While our alliance had two strong robots, the lack of good collectors on the alliance doomed us, and we were eliminated in semifinals after two hard-fought games. In 2014, our team was given the opportunity to play at an extra event, the week 5 Auburn District. We didn’t change that much on our robot, figuring that it already worked quite well. Auburn, however, was much harder than any event we had been to yet. By week 5, the usual late-blooming powerhouse teams had fixed their flaws, and teams had perfected defensive strategies. That combined with another tough schedule had us end up in 15th place. 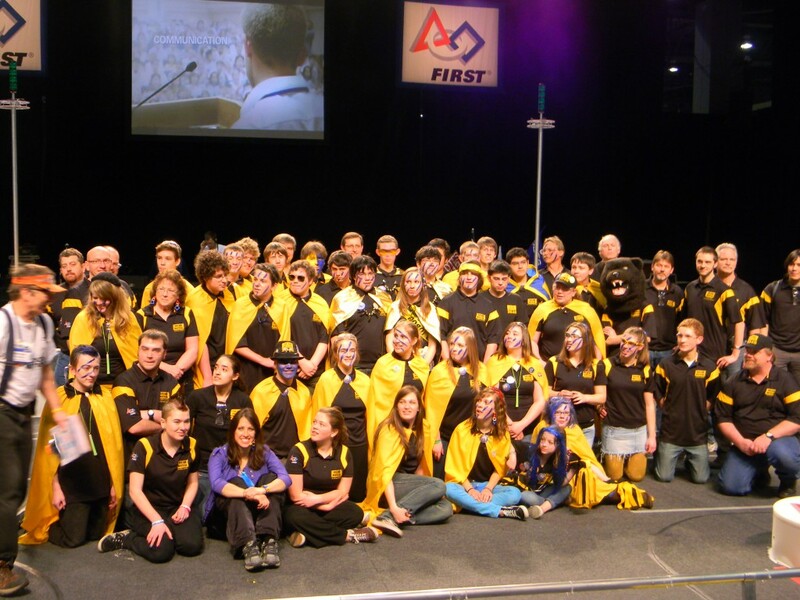 During alliance selections, everyone seemed to forget about our robot, until the 6th seed of 3663 came along. Picking us and then 2147, 3663 was able to create an extremely strong alliance of 3 robots with good collectors out of a late seed. Once our robot entered elimination rounds, a rather disturbing trend started to emerge of our robot restarting randomly, often after a hard hit. This meant that we usually sat dead for about 30 seconds in a match. Despite this, our alliance was able to power through to the Finals, even taking it to a third game before finally losing to the first ranked alliance. Unable to identify with certainty what was causing our stop-and-go issues, we went to DCMP worried. And worried we should have been. Restarts plagued our matches for the first two days, until the problem was finally identified and fixed. However, it was too little too late, as no one wanted to pick us for elimination competition, worried that our problems would return. Because of this, we missed qualifying for World Championships by 2 district points (the equivalent of winning one game). Our season over, we were forced to retire one of our best robots without ever utilizing its potential on the world stage. In the end of the 2012 year, Bear Metal did a lot of volunteer work in order to benefit FIRST and create outreach within the community. This included volunteering our time to make and run a portion of a local Haunted Forest, and running our first Washington Girls Generation Event. Girls Gen is a post season event in which only the girls from teams may compete. It’s a one day event with up to 24 teams, consisting of Qualification rounds and elimination rounds, starting in the semi-finals. Girls Generation was started by a student, Mackenzie Dowell, as her senior project. Mackenzie wanted a way to showcase women in engineering, encouraging them to continue in a field that is disproportionately male. 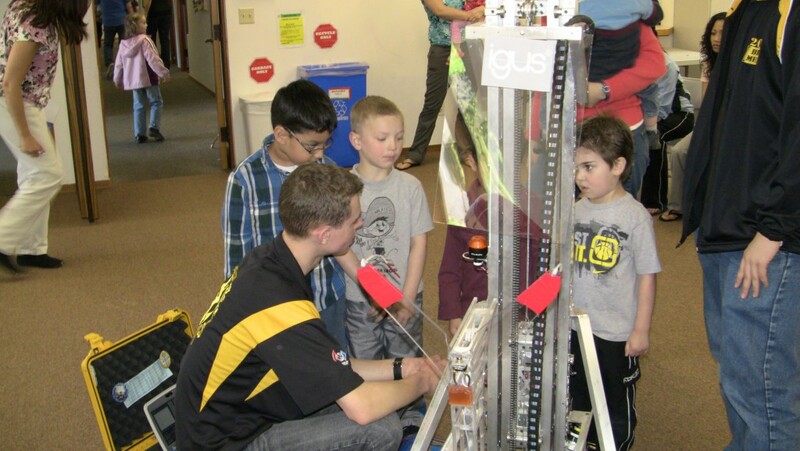 Team members also volunteered at various FTC and FLL events throughout the Pacific Northwest. Hot off our offseason events, Bear Metal went into the 2013 kickoff flush with excitement after our performance the previous year. We came out flummoxed as to how they even came up with this game. Ultimate Ascent’s field was flat with the exception of two large colored pyramids that took up the majority of each alliance’s side. These pyramids could be climbed, with more points for a higher level, with three levels in total. There were also three goals above each player station; one shorter one in the middle, two taller ones, worth a little less on each side. There was another goal near the ground to one side, and on top of the pyramid (into which only colored game pieces could be scored). The game pieces scored into these goals were Frisbees. 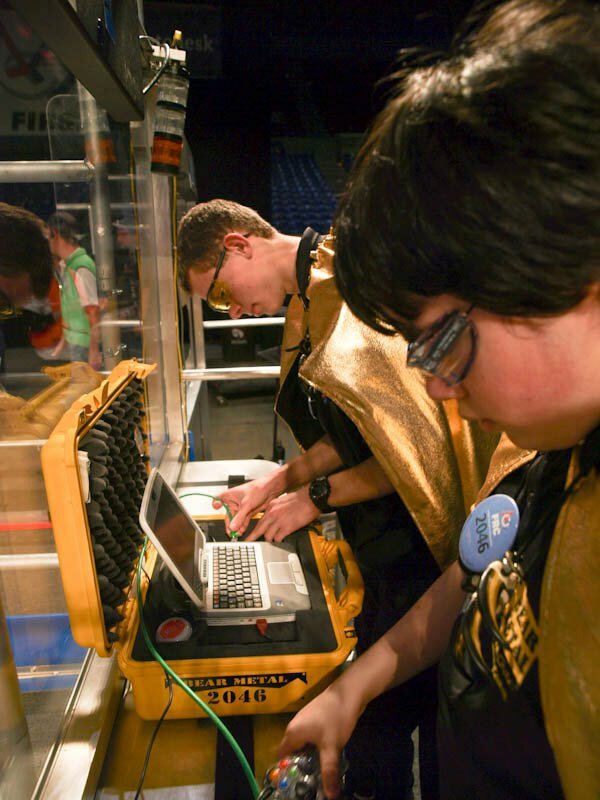 When touching the pyramid, or in the area just next to the feeder station (which is where the team fed into their robots the Frisbees), robots could not be touched. After our strategy meeting, the team decided that we should once again do everything: climbing the pyramid, collecting Frisbees off the ground and collecting them from a feeder station. Early on we recognized that climbing the pyramid was a huge point total that, while difficult to accomplish, could potentially be done very quickly. There were many other ideas thrown out as well, such as shooting from the feeder station (all the way across the field), and making a linear shooter (using a Nerf gun as an example). Both of these were deemed to be too inaccurate and impractical, and the team decided to go for a robot that shot from close, out of the side, using a 180 degree curved shooter. Actually implementing our ideas onto a robot of limited size proved to be a daunting task. In order to climb, ground collect and shoot, the collector had to be limited to a tiny amount of space to one side of the robot, in order to maximize the space for the climber. This meant its deployment device had to go over the height of the bottom bar of the pyramid. The climber also ended up being tall, with a short shooter in between the two towers. This awkward design also made it so the climber was on one end of a long robot, making it even more precarious when climbing. The weight of the climber also caused us to reduce our drivetrain to a 2 CIM drive. Working exceedingly hard through the entire build season, the robot still went into the bag not working close to the way we had wanted. In Portland, nothing went right. The robot couldn’t climb, our mechanism for putting Frisbees into the shooter jammed often, our mobility was limited because of our height, and we could be pushed around easily. The second day went only a little better, as the drivers learned how to drive this new machine. We approached Elimination matches expecting to not be picked, but ended up being the last pick by the first place alliance of 955 and 2471. Throughout the finals matches, those two robots scored an incredible amount of points, while we learned how to play defense by turning our robot sideways and using our climber to block shots. In the finals match, the close scoring was decided by our alliance’s superior defense. Going on to the Central Washington University Regional, we hoped for better. We did improve, making our feeding mechanism better and shooting more accurately. Despite that, our robot still could not climb during any of its matches. Ending up ranked 6th, we chose 488 and 2517, not making it past quarterfinals before being beaten by the eventual winning alliance of 1983, 1425 and 753. At this event we did win the Regional Chairman’s award, qualifying us for the second time that year to go to world championships. St. Louis once again held a huge amount of fantastic robots, inspiring marvels of engineering. One of the things that our team noticed while there is that none of those robots could do everything. 1114 could climb, but they couldn’t ground collect. 254 wasn’t able to collect from the feeder station, but could climb faster than any other robot. The winning alliance on Einstein had only one ground collecting robot, and none of them could climb higher than the first level. While we were not picked for Elimination competition, World Champs still held a bunch of inspiration for our team. The lessons we learned from Ultimate ascent helped to define how our strategy would work for future years. The 2012 game, Rebound Rumble, was a game based around basketball. There were 4 hoops on three different levels into which a team could score foam basketballs. In the middle of the field there were 3 bridges that could be tilted in either direction; the ones on the end were team bridges, where the other team couldn’t go, while the middle one was the Co-operition bridge, upon which either team could cross. Where there wasn’t bridges, there was a bump. The endgame in this year was balancing robots on the team bridge; up to 3 could balance, with more points for more robots balanced. During Qualification matches, one robot from each team could balance on the Co-opertition bridge, giving each team 2 qualification points (2 points were also awarded for a win). After Kickoff, the team went to develop our game strategy, deciding what was most important. Realizing that the bridges and bump would be major obstacles in this game, we wanted a way to easily go over them. However, the team also wanted to have as easy of a time gathering balls as possible, which encouraged a wider drive-base. A wider drivebase made it more likely that the robot would tip over going over the bump, something that Bear Metal refuses to have happen to their robot. It was also decided at this strategy meeting that we would shoot from the “key”, a protected area (couldn’t be pushed by other robots) about a quarter of the field away from the goals. This meant we wanted a tall robot so we couldn’t be blocked, presenting even more tipping worries. Once our strategy was down, we had to figure out how we would actually build a robot that did everything that we wanted. In order to manage the bump and bridges, the team decided that the robot would need a multitool, one that could push down the bridge with ease, as well as helping us go over the bump by being angled on the bottom, acting as a ramp. The issue of driving wide but still having a low center of gravity was solved by putting everything as low as possible. Our turret was mounted at the base of the shooting tower, and all of the electronics and other heavy things were designed to be installed as low as we could. Mounting all these things so low presented a new problem; high centering on the bump. Because our drivebase was so low, we couldn’t use large wheels to avoid that issue. We were also unfamiliar with tread, which could have done the trick. So instead, we decided to mount 5 wheels on both sides of the robot, giving the effect of tread without having to deal with something new & unfamiliar. Building this robot was a huge undertaking, one that required all hands on deck for the entire build season. Despite a huge commitment from most members, the robot still went into the bag only mostly finished. At our first Regional, the Autodesk Oregon one, we faced a myriad of problems, as is to be expected when your robot isn’t actually finished before you bag it. Despite a terrible first day, the robot did very well, and 1983, Skunkworks Robotics, picked us to be their ally. With them we did very well, being eliminated as Finalists by the 8th seed alliance (who used most of the game to balance all 3 robots, outscoring us with that and autonomous). Our performance at this event prompted us to make a few changes. First of all, we added a spinning piece of surgical tubing, and later polycord, to the end of the Multitool to make collecting easier. We also changed our shooter in order to make it more accurate (for a large portion of the Portland competition we shot up close into the 2 point goal because we were too inaccurate from the key). 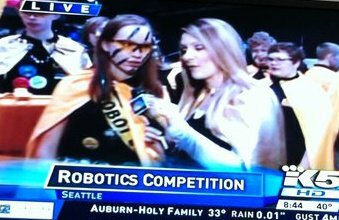 By the time the Seattle Cascade Regional came around, our robot was rearing to go. During the course of the competition we made ourselves a force to be reckoned with, losing only our final match due to a faulty autonomous performance. Picking 2471, Mean Machine, and 492, TRC, we won the event after a close finals match. At this event we also won our first ever Chairman’s award, and Dean Kamen and Christine Gregoire signed our robot. Winning Chairman’s and Seattle qualified us for the world championships in St. Louis. Being able to go and see so many fantastic robots, and seeing teams with robots that were better than ours was a fantastic and humbling experience. On our field we did average, winning and losing about the same number of games, even missing one because we couldn’t find our bumpers. However, the 8th ranked team recognized our abilities and picked us. However, our quarterfinals matches were a daunting task, facing 1114, 2056, and 4334, an alliance that had already won multiple regional events. In our first match we suffered a narrow defeat, but then disaster struck; an unidentified leak was causing our pneumatics to not work properly, meaning that we could not put down our multitool, restricting our ability to collect and go over the bump, as well as making it so we couldn’t turn our turret. Despite using our timeout, the problem could not be found or fixed, and our alliance suffered another close defeat. We did go out with a bang, balancing all three robots on our alliance for the first time all season. Many on the team wonder if we could have won with our robot working properly, helping to prompt changes to make accurate schematics of the pneumatics as well as the electronics on the robot. The FIRST Logomotion 2011 season came with a lot of changes for the club. Before the school year started, the Executive Board noticed and recognized the potential problems associated with the club’s annual doubling in membership. The Executive Board consists of Sean Messenger as President, Victoria Rogers as Vice President, Melissa Gile as Secretary, Mr. Collins as Advisor and Mr. Cahoon as senior mentor. Each year since the club’s founding, we have doubled in size. This year, we were expecting to have upwards of 60 initial members, which we would anticipate dropping to a still above-manageable size for our current organizational structure. This prompted the start of numerous changes. First, our preseason preparation morphed to be more of a class- and lecture-based informational series. We had certain requirements on how many sessions each student must attend, and had student leaders (as opposed to mentors) teach their peers. This was, and continues to be, a pillar upon which the club is based: we emphasize student learning, student “do-ing,” and student accomplishments with the help and assistance of adult mentors. Ultimately, the organization of the preseason sessions was too bulky, new, and inefficient such that those who wanted to learn learned a tremendous amount, whereas most others slid under the radar and didn’t learn or attend as much as they should have. Second, the Executive Board divided the membership up into disjoint teams that worked interdependently with others on small parts of the robot. The end result would be the combination of the teams’ efforts. We envisioned this as a way to divide a giant “heap” of members into more manageable task groups under the advice of a mentor and senior member. This organization change continues to date. Third, echoing our teams’ absurd growth rate, FIRST WA had to host multiple Kickoffs — a first for the state. We attended the new location, Auburn High School; we sat in a huge auditorium with comfortable seating. I remember this as the first year our team sat as a cohesive group, not stretched thin due to a lack of seating. I also noticed that the team felt very comfortable with each other; the upperclassmen, which were a chunk of students who had been in the club for three years or thereabouts, were tight-knit but welcoming of the new members. Everyone was jovial, excited, and intensely anticipating this year’s game. This comfortableness and familiarity continued throughout build season and even competition. During stressful times, I noticed that people rebounded much faster than in previous years. We were getting into the swing of things, getting used to how the season worked. The club was learning, and the members felt more welcome and involved than ever before. “Every now and then I think back to the Logomotion season, and think: “That was by far our best season I have been involved in. The team practically ran itself, they knew what to do.” On top of that, everyone had a lot of fun, and that was our most spirit-ified season to date.” ~ Sean Messenger. Although, our team did end up hitting a few bumps in the road along the way. For example, we did make mistakes during the Seattle competition (such as our tube collecting mechanism not being wide enough to grab hold of the tubes, our mini-bot deployment was occasionally sticky, as well as our autonomous not always being reliable during the matches) and we learned that we should probably make a pre-game checklist for Portland. That idea can come in handy during the next competitions this year, because it is good to make sure our batteries are all charged, the overall bad batteries are separated from the working ones, the computer is hooked up, all the wires and whatnot are fixed, etc. However, despite our difficulties, Bear Metal did very well. When our robot was working, the team played hard, and got results. We made it to quarterfinals at Seattle. Two weeks later, at Portland, we did even better. Our robot’s performance was glorious. We made it to the quarterfinals again, this time by being first seed. At both of these Regionals, and won the Coopertition award, because we loaned (and gave) some of our minibots to other teams, including our fastest minibot. We also won the Autodesk Visualization Award at Seattle. But the achievement for which we are the most satisfied with is the Engineering Inspiration Award, which we won at Seattle. Because of this, we were able to go to St. Louis. We took what we had learned from Seattle and Portland to completely revise our minibot design for Nationals. Because of this, not only did we do better at St. Louis (performance-wise) than at either of the regionals, but we also had more of our older minibots to give to other teams. We were in the quarterfinals once again at St. Louis, but one of the minibots that we gave to another team actually made it to the Einstein field. Our team was more than happy with our competition performance. At the conclusion of the school year, the Messenger family hosted the year-end party. It was a pool party and barbecue at their house during the summer. Some fantastic mentors did the barbecuing, and it was a potluck-style lunch through the day. Some students had already left for college and others had different conflicts, but most everyone was present. The outgoing Executive Board initiated a tradition (which is hoped to continue) of passing on a notebook for each Office. For example, Sean, as President, presented Mark Eads, the incoming President, with a binder that contained printouts and example documents from previous years in addition to comments and bits of advice from previous Presidents (Ryan Cahoon, 2007-2008, Alex Duncan 2009). Victoria Rogers and Melissa Gile had already given Gavin Collins and Elizabeth Burianek theirs, respectively, beforehand. In 2010, Odyssey was our robot and the NASA Mars rovers were our inspiration. The game, Breakaway, required robots to maneuver a soccer ball around the field and score goals. Foot high “bumps” in the middle of the field were a barrier to robots and soccer balls, though tunnels through the bumps allowed smaller robots to go through rather than over. For the end game, there were towers, and a robot could score points by suspending itself from a tower. We felt that the main challenge was going over the bump, and that going over was more important than going through the tunnel. Mr. Cahoon, one of our mentors, had the breakthrough idea: he noted that the Mars rovers “Spirit” and “Opportunity” had to traverse rugged terrain, and they did it with a special rocker mechanism which allowed wheels to ride high and low and high again as the rover moved across the landscape. This was just what we needed to climb over the bumps. We decided on an articulated rocker with the arms in a parallelogram configuration. Once we decided, we began the design process. In 2010, we had only a few designers, though we have improved since then. The process was hectic, dirty, and incomplete. We designed about 80%, and decided the rest could be done in mech-fab. We ended up paying for this. We didn’t have our big mill yet, but A&M Precision Measuring Services in Kent helped us with our major milling tasks. We did have a lathe and a small stepper spindle mill. They were our most important tools – we needed a lot of relatively small parts. Once we got it built, we were constantly making improvements. The main things it had to do, kick the ball and go over the bump, it did well. When it went over the bump, it was almost like it hugged it – like it wrapped itself around the bump. This was beautiful to see! It was exactly what we intended. Kicking was something we had to work at. Actually, the kicker was easy, but retaining the ball as the robot moved was tricky. We experimented, and finally came up with a good solution. A length of high-end surge tube was stretched, like a rod, and spun. It was able to grab the ball and hold it. Spinning at a fairly high speed, the mechanism acquired the ball – an infrared sensor detected when the ball was acquired, and reduced the spin rate to just fast enough to keep the ball as Odyssey moved backward and forward. Our first competition was the Portland regional. Thursday, we were still finalizing the robot, fixing things, etc. We never had a chance to do a practice match. On Friday, we were still fixing things, and we actually missed our first match. We bounced around the bottom of the standings through the day – autonomous mode failed, the battery in the computer died, code didn’t deploy. Still, the mood at the end of the day was one of resolve – do what was needed to fix the problems. As Saturday dawned, it all came together. Everything began to work. The robot was handling well, controlling the ball like we intended, and we were even scoring goals in autonomous mode. Victoria was our driver. Friday was a learning experience and by Saturday she had become very good. This showed throughout the day – driving faster, taking corners better, kicking goals. Going over the bump was tricky – she had to shift multiple times. But once she got it, it was smooth. Even though Friday was a wash out, Saturday we did well and started moving up in the standings. When the time came for the high-standing teams to choose alliance partners for the quarter-finals, we had done well enough that we were noticed and chosen for one of the alliances. We rewarded their faith by performing well – our alliance made it to the semi-finals. In Seattle, instead of bouncing around the bottom, we were at the top of the standings all the way through. We were able to choose our alliance partners for the quarter-finals, and as in Portland, we made it to the semi-finals. It was in Seattle that we won the GM Industrial Design award for the rocker mechanism which allowed us to go over the bump so smoothly. “15 Minutes! That’s all it will take to build this Kit-Bot Chassis”, proclaimed Brian Andrews at the start of our first year. Every year since then, we all (including Andrews himself) think about how completely wrong that was. It always takes several days to build the chassis, the simplest part of our robot. Even in 2009, when our chassis was built from precision machined parts, it still took a few days of work by several students to finish it. Our club succeeds each year because of the hard work and determination of students and mentors alike. Typically, we have a group of “die hard students”, and a great core of mentors who have been around since first year. We also have some new mentors who came in right at the start of this year. Every student and mentor played an extremely valuable role in the construction of “Bearenstein”, our robot for the 2009 FIRST “Lunacy” competition. Not only did we build one robot in the time allotted for construction, but because of the dedication of all our students and mentors, we were able to build a second identical robot. Production was long and arduous. The robot was complex to build, and it was even more complex to drive. Though we had a good team of operators, we couldn’t do every bit of control without computer/programming assistance. The operator interface had about 20 knobs and switches. The two joysticks for the drive base had buttons on their base for the driver to operate. The robot being driven by two people took many late nights at the practice field in Seattle. Even though we spent so much time practicing, we still weren’t the most competitive team in terms of point scoring. However, we were a great asset in other respects such as blocking and pinning other robots, and in maneuvering and evading balls. At the competition in Portland, the days were long and stressful when the robot wasn’t completely operational, or the programming was slightly off, or we were still trying to construct our Traction Control Modules. These are the evils of a rapidly prototyped robot, or anything that is rapidly prototyped for that matter. The prospect that we had overlooked something and the robot wasn’t going to work was frightening. However, the challenge of developing a viable solution is thrilling and satisfying, so the effort was rewarding and well worth it. We won second place at Portland, and also were given the Xerox Creativity Award. In Seattle, we made it to the quarterfinals, and we won the Rockwell Automation Innovation Award. In 2008, the game (“FIRST Overdrive”) required robots to race around the field and score points by lifting or launching giant (48-inch) red and blue excercise balls over 6-foot hurdles. In the end game, a robot could score additional points by placing balls atop a hurdle. And, a robot could thwart an opponent by knocking the opponent’s balls off the hurdle. Our team analyzed various concepts for a drive train, manipulator, and game strategy. After much discussion, the team finally settled on a 6-wheel drive cantilever chassis with a 3-stage aluminum extrusion elevator lift. Twin motors drove the lift from floor to hurdle in just 3 seconds. Omni-mounted corner wheels gave an exceptional level of maneuverability. Looking like a cyclops, Catalyst used a pneumatic-powered tri-fingered grabber to reach out and embrace the ball, lifting it above the heads of spectators near the field, and dropping it over the hurdle, or gently placing it atop the hurdle. It was generally agreed, by those who know, that Catalyst was the most dangerous-looking robot around. With its maneuverability and control, Catalyst was merciless, and relentlessly scored against opponents. Our team was a finalist at the Portland regional competition, but we were just getting warmed up. At Seattle, we went all the way, winning the regional championship and advancing to the world championship in Atlanta, Georgia. We also won the Motorola Quality Award. The competition at Atlanta is of a different order. The best teams in the country, those with years of experience, come here. This was only our second year as a team. There are so many teams at the championship that they are divided into four divisions. We played in the Galileo division, and advanced through the elimination rounds to the quarterfinals. There we formed an alliance with Skunkworks (team 1983) and Las Guerrillas (team 469). Alas, we were outmatched and didn’t make it beyond the quarterfinals. The 2007 build season was definitely one to remember. We tossed around basic ideas, and then we designed and built as we went along. “Precise Enough” was truly the team motto. Thanks to the dedication of the core members and mentors, the club managed to make it all come together. We shared a joint practice field with several other teams. It seemed some of the teams never showed up, but we were there all the time. We really had no idea what to expect in Portland. Amazingly enough, our team was one of the few that had a reliable autonomous mode, and this turned heads at the competition. Picking alliances was no easy task. We never thought we’d finish in the top eight, and didn’t do any scouting. We picked teams 360 and 2149 but didn’t make it past the quarter-finals. Our performance, though, was enough to impress the judges, and they awarded us the Rookie All-Star Award. Then we realized that the award came with an invitation to the FIRST championship in Atlanta. The atmosphere in Atlanta was much stronger than it was in Portland. 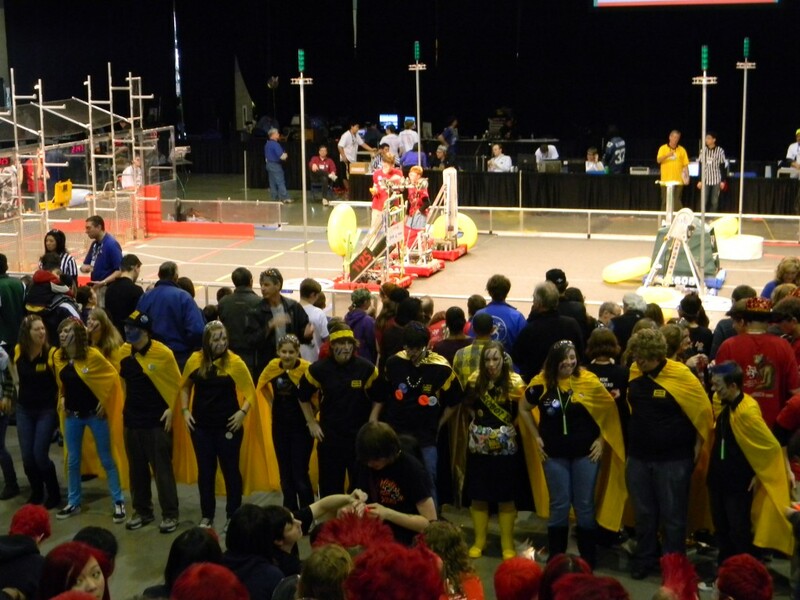 344 FRC teams competed on four fields. It was overwhelming. We flipped a number of times during the endgame but our autonomous mode worked beautifully. We finished with a record of 5-2 and were ranked in the top 15 on our field. Our robot broke in our last match, but we managed to fix it quickly. Sadly, none of the top eight alliances picked us, so we didn’t get to compete in the elimination rounds. We learned a lot that year, and we were proud of what we had accomplished. Somehow, with a lot of dedication and intuition, we managed to put our foot in the door toward becoming a powerhouse team in the Northwest.